In whitewater and swiftwater rescue, ropes are sometimes used to haul on pinned boats or for transportation systems. Strong anchors are important. Why tie a load-sharing (aka multi-point) anchor? Often, shorelines will have large enough trees or rocks that we can rely on just one anchor. If there isn’t one strong object to tie onto, we can attach two or more objects together to share the load. 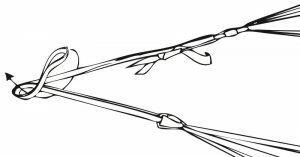 When unpinning kayaks, canoes, or rafts, anticipate the direction of pull changing as the boat comes off. ‘Basket’, ‘simple’, and ‘multi-wrap’ (e.g. 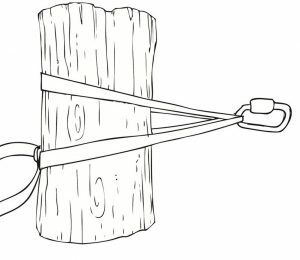 wrap 3 pull 2) anchors maintain their strength as the load moves. If using multiple points, a ‘load-sharing self-equalizing anchor’ (see diagram below) will continue to distribute the load between the anchor points. See the load sharing anchor diagrams below to learn the difference between self equalizing /”self-protecting” versus fixed and focused. 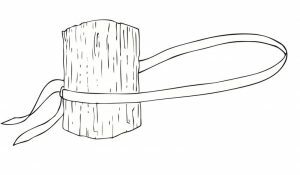 1″ nylon tubular webbing is often used for anchors around rivers because it is strong, abrasion resistant, and cheap: better to risk damaging a piece of webbing for an anchor around a sharp-edged rock than damage your nice rope. Low-stretch, strong rope can also be used. A carabiner is much weaker with its gate open. Locking carabiners will not open accidentally and are therefore more secure for use in rope systems during rescues. 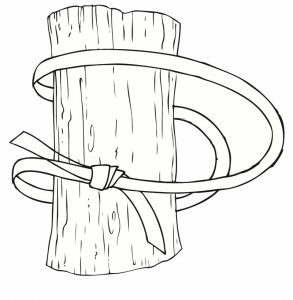 Use a Water Knot to tie the webbing into a loop. These are often called Load Sharing Self-Equalizing “Self-Protecting” Anchors. 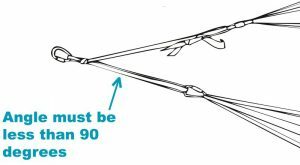 They are used in swiftwater rescue situations when it is expected that the position of the load will shift (e.g., a boat full of water moving downstream). The twist on one of the lines adds some protection, preventing the carabiner from slipping out of the system if one of the anchor points breaks. 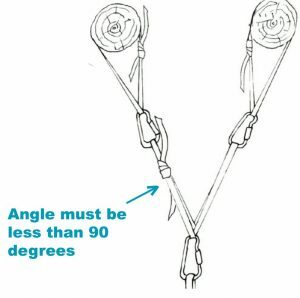 However, as many high angle rescue riggers will point out, if one anchor point does break, the other will be shock loaded, likely causing it to break as well. For this reason, we put “self protecting” in quotations. On the other hand, a Fixed and Focused Anchor (see below), will not shock load, and is truly self protecting, but will not self equalize to share the force from a moving load. Fixed and Focused anchors are used when we are not expecting the load to shift drastically in either direction, as is the case with most high angle and transportation systems (e.g., tension diagonal). 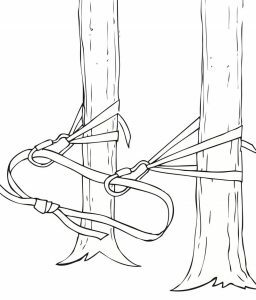 Learn how to tie the rescue knots used for these anchors.